The TA2 York pull behind grading/landscape rakes are designed to be pulled behind a larger ATV or larger garden tractors of 10 hp and up. York Rakes give you a smooth well groomed surface, and can also be equipped with the optional grader blade assembly, which can be flipped up when not in use. York Rakes can be use for soil smoothing and preparation at: drives and trails; tennis courts; bridle paths; athletic fields; parking areas; parks and playgrounds; golf courses; cemeteries; cinder tracks; baseball diamonds and other areas. 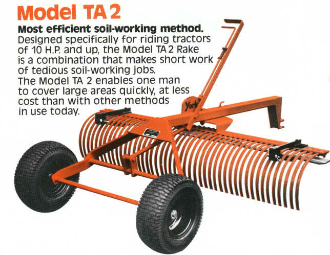 Model 2214 TA2 is a TA2 series rake 4 ft. wide. The TA2 has larger wheels and frame than the TA1 series, so it is better to tow over rough ground and is designed for use with tow vehicles 10 hp or more (larger garden tractors, ATVs, small landscape tractors).